I had a recent request for a vegetarian burger and I’ve decided to share my version. 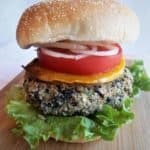 I have tried tofu burgers and other vegetarian burgers but black bean burgers are my favorite. 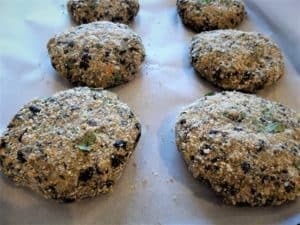 The texture of black beans, chewy and meaty, are suitable for burgers, and the color helps to make them look like burgers as well. 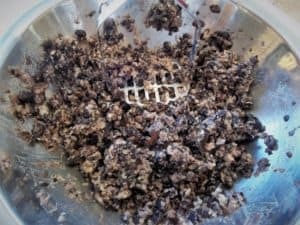 I applied the same technique that I use whenever I cook with ground meat, whether I make burgers, meatloaf, chili or whatever. That is, I add a grated carrot and zucchini to the meat mixture. I adopted this habit years ago when I struggled to get my children to eat vegetables. 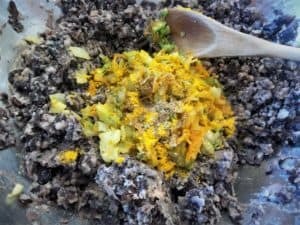 Worried about whether they were getting the proper nutrition, I attempted to add grated or even pureed vegetables in dishes where they would not be easily detectable. It worked most of the time, until I added grated beets to the chili and it came out exaggeratedly red! I guess I went a little too far. I’ve since learned to tone it down. Aside from the beet experience, they were not able to detect the bits of vegetables and I was a happy mom! I continue to use this technique today ’cause quite frankly it tastes good and the veggies add moisture to the recipe as well. Sauté the vegetables for a few minutes in order to sweat them out otherwise they’ll release their water during the cooking and make them soggy. I also prefer to cook my own black beans when possible. It may seem time consuming but you can easily soak them overnight and cook them in your slow cooker the next day while you’re at work. The beans will be ready by the time you’re home. Or, you can cook them in a pressure cooker for about one hour one evening and they’ll be ready for your burgers the next day. You can also cook them ahead of time and freeze them in portions ready for your recipes. I always reserve the cooking liquid to make dirty beans with rice. So as you can see, the possibilities are endless! Of course, you can always use canned beans. I would use two cans for this recipe. 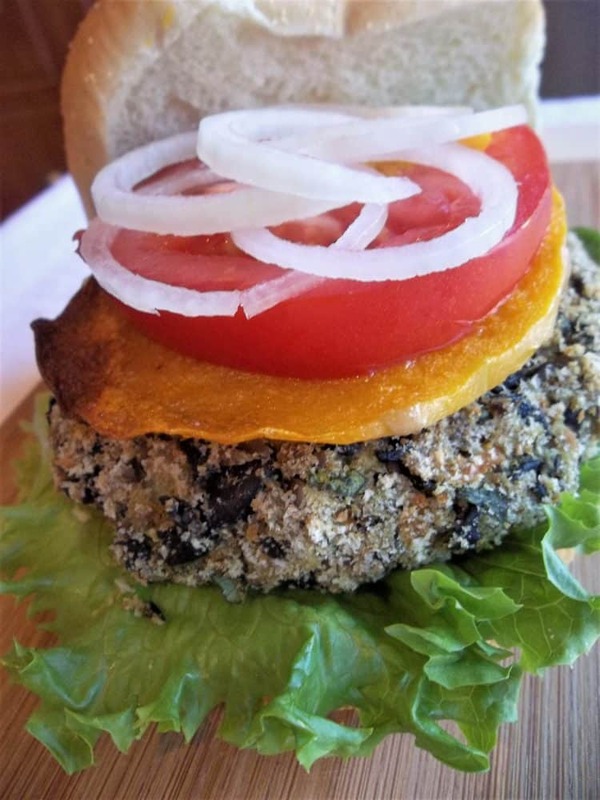 So back to the black bean burgers: the mixture of black beans with the grated veggies; bread crumbs; an egg to bind the mixture together; cilantro and spices make a perfect vegetarian burger. And most importantly my worst critics love them! To tell you the truth, when I made them the other night I was wondering what they might taste like with a slice of bacon on top! Ha! Begin by soaking black beans overnight or for at least 6 hours. Drain, rinse, place in a large pot and cover with at least 2 inches of water. Boil for approximately 1 1/2 hours or until tender. Drain beans, reserving the cooking water for another use, and place in a large mixing bowl. Mash the beans with a potato masher, but not until completely puréed. Allow to cool. Heat oil in a large pan over medium high heat. Add carrot, zucchini, onion and garlic and sauté for 5-7 minutes. Add the vegetables to the bowl with the beans. Prepare a baking sheet with parchment paper greased with olive oil. Add the remaining ingredients to the bean mixture and combine well, using your hands. Divide the mixture into 8 and shape into patties. Place on prepared baking sheet and refrigerate for 20-30 minutes until they are firm. Meanwhile, preheat your oven to 400°F. Bake for 10-12 minutes on each side until browned. Serve immediately with your favorite toppings.